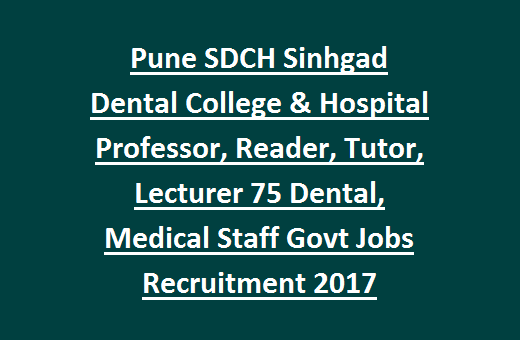 Pune SDCH Dental/Medical Staff Recruitment 2017: Sinhgad Dental College & Hospital (SDCH), Pune has issued Notification to recruit the Professor, Reader, Tutor and Lecturer Jobs of Dental and Medical Staff. 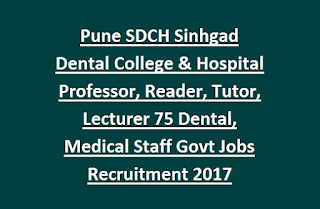 There are total 75 jobs available in SDCH Dental Hospital Pune. Willing and qualified candidates can submit their application on plain paper or prescribed format along with all attested copies to be reachable to SDCH Pune on or before 23-02-2017. The selection for this SDCH Recruitment 2017 will be based on performance in interview and previous work experience. Qualifications, Experience, age limits, and more information is given below for Sinhgad Dental College & Hospital (SDCH) Recruitment of Professor, Reader, Tutor and Lecturer Jobs. There are total 75 vacancies available in SDCH. For Department and Subject wise vacancies please refer the official notification. For Lecturer Posts: MBBS Qualification with 3 years teaching experience in Registrar/Resident/Tutor/Demonstrator. Age limits are applicable as per MCI Norms. Selection for SDCH Hospital Dental/Medical Staff Recruitment will be held through personal interview and previous work experience. To apply for Sinhgad Dental College & Hospital (SDCH) Dental Staff and Medical Staff candidate can send the application form in a plain paper or in prescribed format along with attested copies of all educational certificates, experience certificates, MCI Registration certificate, DOB Certificate, ID and Address Proof, Community Certificate and if any other related documents to the "The Principal, at Sinhgad Technical Education Society, Sinhgad Dental College & Hospital, S.No. 44/1, Vadgaon (BK), Off. Sinhgad Road, Pune – 411 041". Last date to reach the receipt of application form is 23 February 2017.